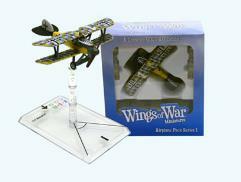 Wings of War Miniatures take your Wings of War game into three dimensions! Each pre-painted plastic model depicts a unique, historical warplane from the Wings of War game, complete with maneuver deck and variable-altitude stand. Out fly and outfight your friends like never before!